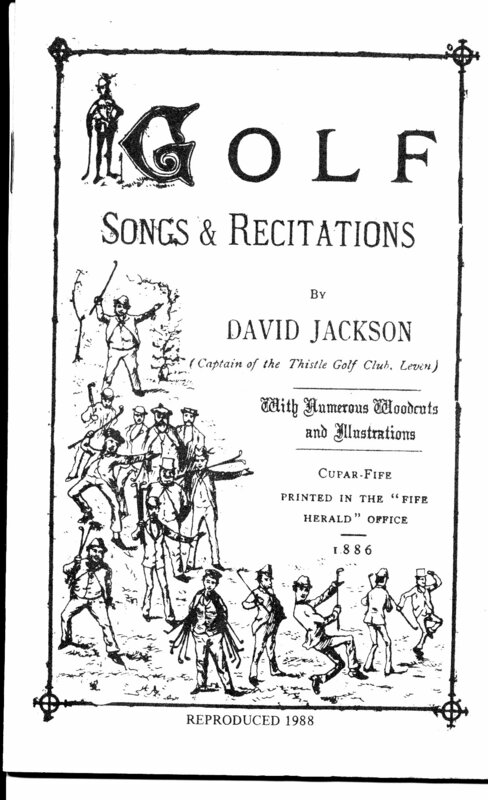 I am always on the lookout for old golf poetry books that I can afford. Recently I bid on a book published in England in 1905 called The Golf Craze ─ Sketches and Rhymes by “Cleeke Shotte, Esq.” It was offered by the PBA Galleries in San Francisco. And I won it. The book was actually written by John Hogben, a member of the Duddingston Golf Club in Edinburgh and its captain in 1921. 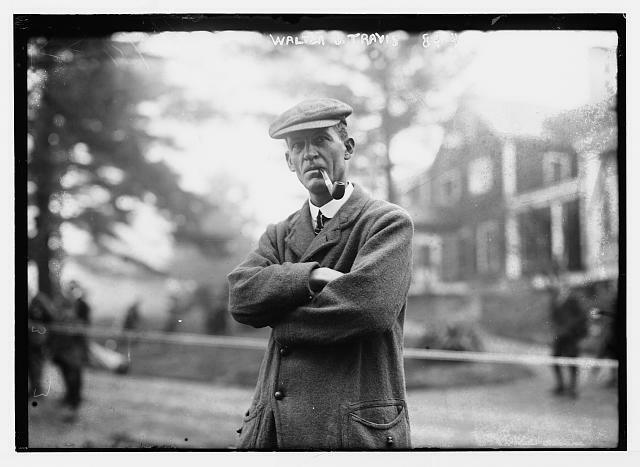 Included among the rhymes was one titled “To Mr. W. J. Travis ─ Amateur Golf Champion, 1904.” For our purposes, you need to know that Walter J. Travis was born in Australia in January 1862. He came to New York City at age 23. He began playing golf in October 1896, three months short of his 35th birthday. He soon began playing competitively. Now comes the most remarkable part: In 1900, 1901, and 1903 he won the U.S. Amateur Championship; and, in 1904 he became the first American (he was by now a naturalized citizen) to win the British Amateur Championship. He went on to do many other impressive golf-related things before he died in 1927. You can read more about Travis at http://bit.ly/Q0VKvX. The lust of conquest reigns in U.S.A.
And sent it straight, and far, and surely home. Amazement that we owe to your strange putter. Without whom neither golf nor golfer were. We sowed the seed; the world has reaped the flowers. The mimic helps to stay the mighty war. Were you not cradled under Austral skies? The “strange putter” was the so called Schenectady Putter invented by a General Electric engineer in 1902. Travis made the putter famous when he used it in the 1902 U. S. Amateur Championship. The aluminum Schenectady Putter was mallet-headed and center shafted. Travis used it again to win the 1903 U. S. Amateur and, of course, the British Amateur in 1904. In 1910 the R & A, the ruling body for golf in Great Britain, banned the Schenectady Putter and others of similar design. The U.S.G.A. did not follow suit. But still, in light of the current controversy regarding “anchored” putters, it is interesting to note that there is a precedent for a ruling body to ban a class of putters being played. If you have a comment, I would be pleased if you would share it below. This year may not have been the greatest for golf, professional and otherwise, but it was a great year for golf poetry. This Blog got more than 20,000 page views and the subject of golf poetry was featured in a May Wall St. Journal article. Hopefully, 2011 will be an even bigger year with the publication of my book, Golf Course of Rhymes — Links Between Golf and Poetry Through the Ages, by Golfiana Press. With hearts elate and mind content–oh, Gouff dings a’. Yer Clubs a’ in guid (good) order; yer Cleeks and Irons like steel. About our jolly game o’ Gouff–for Gouff dings a’. Australia and our Colonies pay homage to the game. In case his men forgot the way to fight for King and Crown. They played the game through a’ the week, and on the Sunday, too. Who loves the jolly game o’ Gouff–for Gouff dings a’. So next Friday night when you “take a cup of kindness yet,/ for auld lang syne,” take one as well for David Jackson and the game he describes so lovingly. Last week I received an email from a friend from the Netherlands who was kind enough to forward to me this week’s poem, “The Wreck of the Golfer.” The poem was written by Andrew Barton “Banjo” Paterson (1864 – 1941), a famous Australian poet, journalist and author. One of Paterson’s most famous poems is “Waltzing Matilda,” which was set to music and became one of Australian’s most famous songs. Paterson’s image appeared on an Australian postage stamp in 1981 and today graces Australia’s 10 dollar note. And flourish it such a lot?" "You watch it fly o'er the fences high!" And he tried with a brassey shot. Just there where the brambles twine?" But he got on the green in nine. And I've landed him with my drive." Fall down on his knees and cry?" And he thinks once hit twice shy." Fell down with a woeful splash. Till it flies like the carded wool?" For his heart was much too full. A pallid corpse was he. Had landed and laid him low. When next to the links we go. As a reference point, the first golf club in Australia, the Australian Golf Club in Sydney, was established in 1882. However, Paterson’s relationship to golf has yet to be determined. I have written to a researcher in Australia and if she turns up something I will pass it on. Any comments regarding Paterson’s links to golf would be appreciated. In the mean time, we have our first historic golf poem from Australia.